PROSALON is a high quality cosmetics for hair colouring, care, treatment and styling destined exclusively for hairdressers. New to the range are new hair dyes – PROSALON INTENSIS COLOR ART in 73 fashionable shades of hair colours, cosmetics for MEN and for CURLY HAIR. 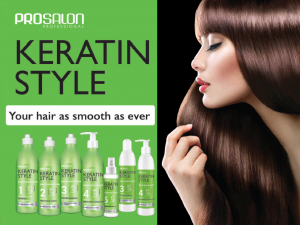 Innovative product on hairdressing market is KERATIN STYLE – hair smoothing treatment based on keratin, without parabens and formaldehyde. Prosalon INTENSIS extends our offer with a series of cosmetics for hair moisturizing, enlarging its volume and colour protecting. We also offer hair cure complexes under our sub-brand PROSALON MED and strongly regenerating hair – ARGAN OIL line. Prosalon also has their own hairdressing academy, where various courses and master classes are organized.